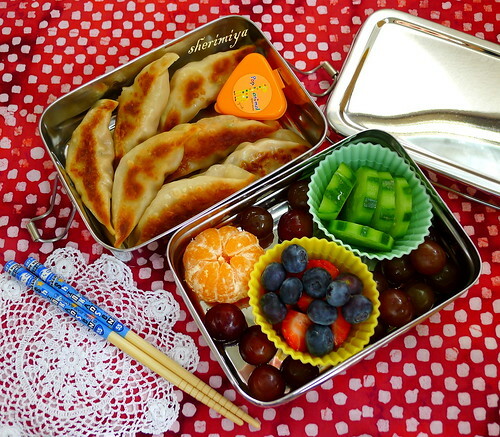 Gyoza EcoLunchBox Bento, a photo by sherimiya ♥ on Flickr. Today's bento is packed in my super awesome EcoLunchBox two-tier set, with homemade pork gyoza (see my method and recipe here) in the lower part and a variety of refreshment in the upper part: baby satsuma, a smattering of grapes, strawberry, blueberries, and house-pickled cucumbers. 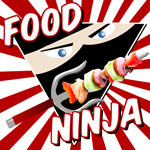 Gyoza are guaranteed kid-pleasers, tasty with or without dipping sauce, easy-to-eat finger food, and made for bento. I made my filling with pork and chopped baby bok choy, because I'm wild like that. You can use almost anything you like: even mushroom, scallions, water chestnuts (for crunch), bean sprouts, whatever. Hope you all had a great weekend! Hope you like it Rose, thank you!